CliniComp, fresh off its failed legal challenge of the VA’s choice of Cerner in a no-bid contract, sues Cerner for patent violation. 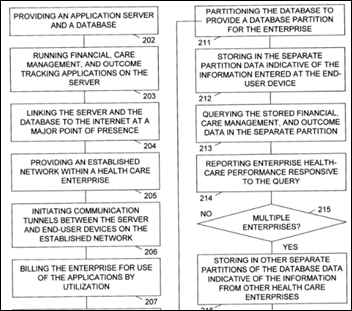 CliniComp says Cerner violated its 2003 patent for a remote hosted hospital system. From Dirty Dirge: “Re: big health system mergers. Who wins, Epic or Cerner?” I would instead ask whether the potential benefits of standardizing systems justify ripping and replacing existing EHRs when their sites cover a big swath of geography without much service area overlap. Maybe it’s OK to limit patient information exchange to the basics, like CCDs, since patients rarely seek care outside their local area. The most compelling argument would be populating a single database that can support analytics, operational analysis, research, and best practices, but that could theoretically be done on the back end with a lot of semantic data translation. The only comparably sized model is the Kaiser’s use of Epic, but their implementation happened a long time ago; they have more focused corporate control than I would expect of newly merged health systems that can’t even name a single CEO; and Kaiser controls more of the patient experience as an insurer as well as a provider. Perhaps most at risk are Allscripts ambulatory or Meditech in sites included in the merger plans. My guess would be that the highest-priority system projects would involve administrative systems to allow executives to get a handle on their sprawling enterprises. We are really entering uncharted territory since most “huge” health systems have revenue of $2-5 billion vs. the dozens of billions that the proposed mega-mergers would create. Lower-tier vendors should take note – as hard as it already is to sell systems, it’s about to get a lot harder when you have to earn face time with a CIO who controls the IT strategy and budget of more than 100 hospitals (in comparison, Kaiser has only 39 hospitals). Dignity Health’s 48 hospitals run Cerner Millennium. 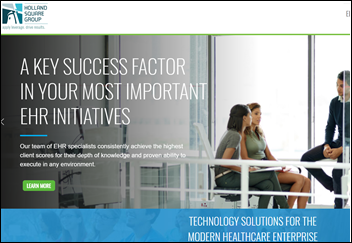 Catholic Health Initiative’s 153 hospitals use Cerner (61), Epic (65), and Meditech (27), also on the ambulatory side running McKesson (4) and Allscripts (21). Ascension Health’s 132 hospitals use Cerner except for Providence and Wheaton Franciscan, which use Epic. Providence St. Joseph’s 58 hospitals use Epic (37), Meditech (19), and Allscripts (3). In terms of dominant vendor in the two proposed mega-mergers, it’s obviously Cerner over Epic (109 vs. 65 and 130 vs. 39, respectively). Here’s a fun opportunity for Definitive or HIMSS Analytics to list the major systems (beyond just the EHR) used by these health systems that are contemplating merging. From Comprn: “Re: Lifepoint Health. RIF including multiple VPs, about 25 FTEs, due to lower-than-expected earnings.” Unverified. The 72-hospital company cut its revenue and profit forecasts in late October due to fewer-than-expected admissions for the fiscal year. LPNT shares are down 15 percent over the past year vs. the Nasdaq’s gain of 27 percent, valuing the company at $2 billion. It’s probably tough competing with systems bigger than yours that don’t pay taxes and that are equally profit-motivated. From Trust but Verify: “Re: White House EHR meeting. A news site says [publication name omitted] broke the story but I saw it two days before on HIStalk.” Correct. An anonymous reader sent me the agenda via my Rumor Report online form and I posted the information in Sunday night’s post. Nobody else ran anything that I saw until at least Monday morning, so I’m pretty sure all mentions were triggered by reading it on HIStalk. One site that emailed me late Sunday ran their item (with the agenda that I sent them) Monday morning, but didn’t give credit. I’m also surprised at news organizations that cite one particular health IT website as a source when it’s pretty much like Wikipedia, with no original content. Take-home family math activities for Ms. D’s elementary school class in Houston, TX. 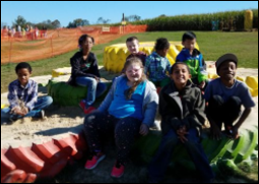 Hands-on math games for Ms. K’s first-grade class in Indianapolis, IN. Games for science game night for Mrs. S’s elementary school in Gautier, MS.
Microscopes, telescopes, and science kits for Mrs. B’s elementary school class in Gulfport, MS. Take-home science activity kits for Mrs. M’s elementary school class in Chattanooga, TN. STEM kits for Mrs. M’s elementary school class in Paterson, NJ. STEM books and activity kits for Mrs. H’s elementary school class in Sugar Creek, MO. Programmable robots for Mrs. G’s elementary school class in Brownsville, TX. After-school science kits and supplies for Mrs. P’s elementary school class in Pocatello, ID. 200 sets of headphones for Ms. C’s elementary school class in Provo, UT. STEM project kits for family game nights for Ms. M’s elementary school class in Fayetteville, NC. Programmable robots and a Chromebook for Mrs. G’s elementary school class in Miami Gardens, FL. STEM kits for Ms. T’s elementary school class in Bronx, NY. STEM project kits for family game nights for Mrs. H’s elementary school class in Canyon, TX. Programmable robots for Mrs. F’s high school class in Glen Dale, WV. STEM activity kits for a student-led STEM gender and ethnic diversity project of Mrs. I’s high school class in Orangeburg, SC. 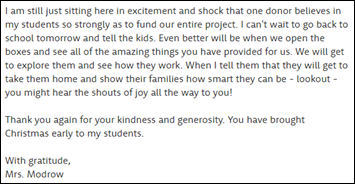 Math and science resources for Ms. S’s first-grade class in Dayton, OH. Headphones for the technology lab of Ms. W’s elementary school class in Memphis, TN. 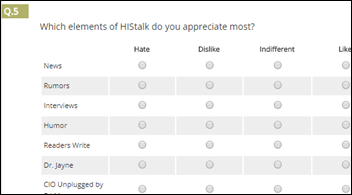 Can you please take 3-5 minutes to complete my once-yearly, one-page HIStalk reader survey? I’ll use the results to plan for 2018, but if you need even more motivation, I’ll be randomly drawing respondents to win a $50 Amazon gift card. Thank you. 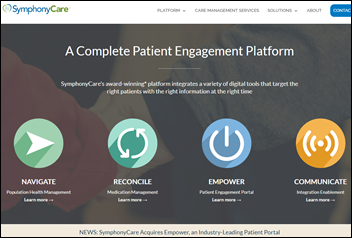 Population health management systems vendor SymphonyCare acquires Influence Health’s Empower patient portal business. 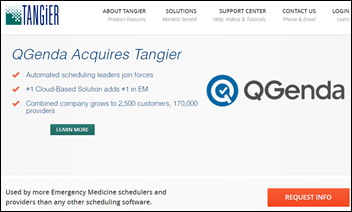 Physician scheduling system vendor QGenda acquires ED physician scheduling software vendor Tangier. Aetna CEO Mark Bertolini tells investors that he envisions that a merger with CVS would allow placing health hubs in pharmacies that would serve as health system navigators, especially for the 60 percent of people who don’t have a regular doctor. He says it could work like the Genius Bar in Apple Stores. Nashville-based health IT staffing firm ALKU acquires Holland Square Group, a health IT consulting firm also based in the Nashville area. Holland Square Group is a DoD MHS Genesis subcontractor under Leidos. 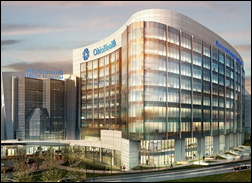 OhioHealth (OH) chooses Casechek’s implant supply chain automation. Hans Morefield (Experian) joins substance use disorder technology vendor Chess Health as CEO. 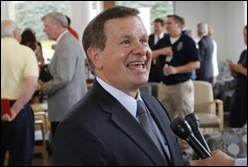 The company’s executive chair is industry long-timer John Holton. CTG hires Jeff Gerkin (Manpower Group) as EVP of sales. Brett Jarvis (LinkedIn) will join Solutionreach as SVP of customer success. 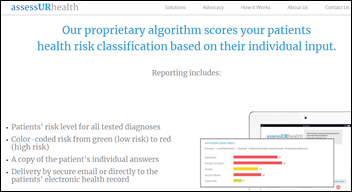 Mental and behavioral screening software vendor AssessURhealth offers its app on the Athenahealth Marketplace. 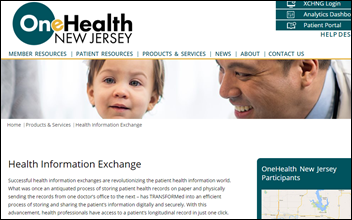 New Jersey’s state medical society brings its OneHealth New Jersey HIE live. 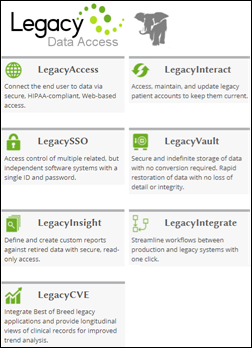 Legacy Data Access will offer its 800 hospital customers a hosted, AI-powered clinical data service in partnership with Life2. Firelands Regional Medical Center (OH) goes live on Meditech’s Web EHR. 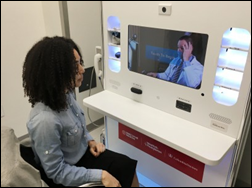 New York – Presbyterian installs telemedicine kiosks in some of its New York-based Duane Read drugstores, making its ED doctors available to review problems that are not life-threatening. 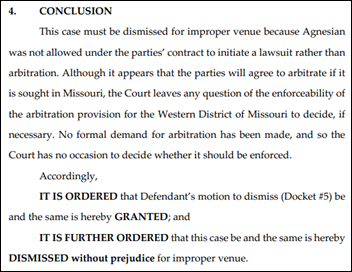 A Wisconsin judge dismisses the revenue cycle system lawsuit that Agnesian Healthcare filed against Cerner, noting that Agnesian’s contract requires it to submit to arbitration in Cerner’s home state of Missouri instead of suing. Anesian claimed in the now-dismissed September 2017 lawsuit that a botched RCM conversion from McKesson to Cerner in 2015 cost it $16 million in revenue and $200,000 per month due to coding and billing errors, while Cerner insists that it fixed the problems in 2016. CDC Director Brenda Fitzgerald is recusing herself from issues related to health IT and oncology because she is legally required to keep her illiquid investments in LLCs involving Greenway Health (EHRs) and Isommune (cancer detection). Fitzgerald – a former OB-GYN, Air Force major, and commissioner of Georgia’s Department of Public Health – and her ED physician husband reported assets valued at up to $16 million. 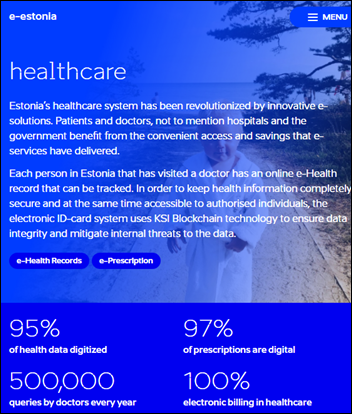 “I’ll show you a digital health record,” she said, to explain. “A doctor from here”—a file from one clinic—“can see the research that this doctor”—she pointed to another—“does.” She’d locked a third record, from a female-medicine practice, so that no other doctor would be able to see it … E-ambulance is keyed onto X-Road, and allows paramedics to access patients’ medical records, meaning that the team that arrives for your chest pains will have access to your latest cardiology report and ECG. Since 2011, the hospital has also run a telemedicine system … Rita Beljuskina, a nurse anesthetist, led me through a wide hallway lined with steel doors leading to the eighteen operating theatres. Screens above us showed eighteen columns, each marked out with 24 hours. Surgeons book their patients into the queue, Beljuskina explained, along with urgency levels and any machinery or personnel they might need. An on-call anesthesiologist schedules them in order to optimize the theatres and the equipment … She logged on with her own ID. If she were to glance at any patient’s data, she explained, the access would be tagged to her name, and she would get a call inquiring why it was necessary. The system also scans for drug interactions, so if your otolaryngologist prescribes something that clashes with the pills your cardiologist told you to take, the computer will put up a red flag. Respondents were apparently self-selected and only completed an online survey. If only AMA members were polled (the report doesn’t say), that would be only a tiny, non-representative subset of all US doctors. Respondent demographics were not provided, such as the size of their practice site or whether they work for a health system. Half of respondents say they have an in-house security official, although the question wasn’t asked about that person’s time allocation and credentials. 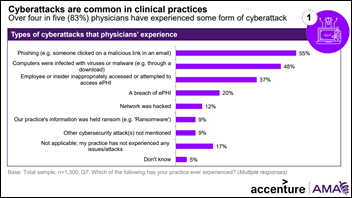 More than one-fourth of responding physicians say they have outsourced security management, but the survey didn’t ask what that means. More than half of respondents say someone clicked on a phishing link, which doesn’t really seem like a cyberattack unless it resulted in downtime. Only 37 percent reported that an employee inappropriately accessed PHI, which is surely low. 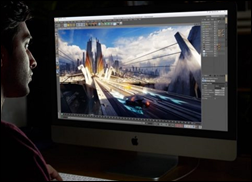 Apple will launch the IMac Pro this week at an entry price of $5,000 for 32 GB of memory and 1 TB of storage and up to $17K for a fully loaded machine, testing the limits of just how much of an Apple tax even professional users are willing to pay. It’s not an Apples-to-apples comparison, but my Acer laptop has 16 GB, 1 TB (along with a 128 GB SSDD for running Windows 10) and cheap available upgrades and I only paid a bit more than $500. Even that capacity is excessive since nearly everything I use is on the Web. Two-thirds of the few dozen interviewed patients who got their lab results via a clinic’s patient portal weren’t given further explanation, sending most of them to Google to try to figure out what the results mean. The article concludes that just displaying lab numbers on a portal isn’t enough, especially for patients with abnormal results. 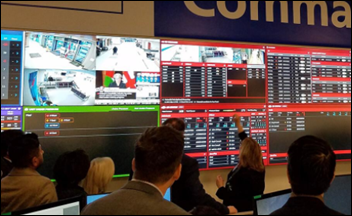 In Canada, all-digital Humber River Hospital opens a Meditech-powered, 4,500-square-foot Command Centre in which staff monitor real-time incidents such as delayed care and provider workload issues. It also contains a 26-panel GE Wall of Analytics with live video feeds from patient care areas. A just-published review of a 2016 Netherlands bake-off of 32 algorithms that analyze tissue slides to detect breast cancer metastasis finds that seven performed better than a panel of 11 pathologists when limited by typical workflow time constraints. The best algorithms performed equal to the pathologist panel when time constraints were removed. A review of 1,300 clinic visits finds that patients asked their doctors for specific lab tests, referrals, pain meds, other medication an average of once per visit; the doctor agreed to write the order for what they wanted 85 percent of the time; and those patients who were turned down gave the doctor lower satisfaction scores. Javon Bea, CEO of five-hospital Mercyhealth (WI), was paid $8.38 million in 2016, far more than basically any charity or health system. The newest tax form I found was from 2014 and even then the CIO made over $750,000. Maybe nobody wants to live in Janesville, WI or work for Mercyhealth if they have to pay that much. Axios notes that even under his previously slightly lower pay, Bea earned $72 per patient day, although he told the local paper that his then-$3 million paycheck had no impact on healthcare costs even as he increased the system’s revenue from $33 million to $1 billion. Spok launches a library of stories illustrating the ROI of clinical communication technology. Optimum Healthcare IT completes its work as primary partner for UCI Health in its Epic Connect strategic partnership with UC San Diego Health. Change Healthcare SVP of Product Development and Technology Michael Wood joins the 2018 Class of the Nashville Health Care Council Fellows. AssesURHealth raises $2,700 for the American Foundation for Suicide Prevention as part of the Out of the Darkness Tampa Bay Walk. 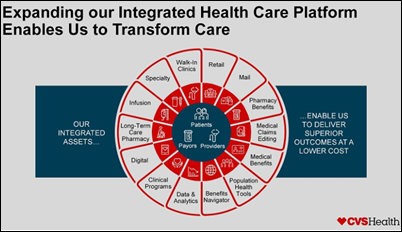 Change Healthcare will integrate Tibco’s Connected Intelligence product line with its products. Glassdoor includes CoverMyMeds in its list of Best Places to Work in 2018. Diameter Health achieves NCQA Certification for all 2017 e-measures. Vyne’s Trace and FastAttach solutions earn HITRUST CSF certification. EClinicalWorks will exhibit at the New York Society for Gastrointestinal Endoscopy 41st Annual New York Course December 14-15 in New York City. The “I Love Madison Podcast” features Healthfinch VP of Finance and Operations Leah Roe. Technology Headlines Magazine names Intelligent Medical Objects CEO Frank Naeymi-Rad one of the 50 Most Admired CEOs of 2017. What, exactly, did Uncle Neal do for rural hospitals and healthcare? Was this the focus of the Patterson foundation? In addition to the Patterson Health Center, I know that Neal Patterson endowed Oklahoma State University’s Center for Health Systems Innovation. 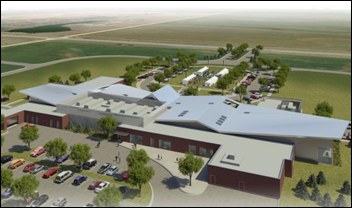 Its focus is innovation in rural and Native American care (Oklahoma is home to the Cherokee Nation). https://www.ok.gov/ocast/documents/CHSI.pdf Among other tools, they use Cerner’s massive Health Facts database to uncover insights about rural and Native American care. Can someone provide more information/background on why Epic did not attend the Kushner meeting? Politico reported that “An Epic official was invited but overlooked the e-mail invitation while traveling last week.” That sounds like an unacceptable excuse. Who cares? Does anyone actually believe that Kushner or this administration is going to have a meaningful impact on the healthcare industry besides cheerleading whatever McConnel and Ryan come up with (or conversely, criticizing it if it’s politically expedient)? Does anyone actually believe Kushner is going to escape indictment long enough to even have a chance have an impact?